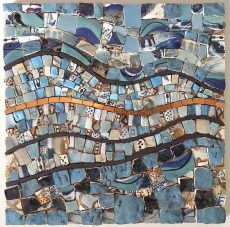 Jude Nelson-Freeman is a mosaic artist living between England and Italy. 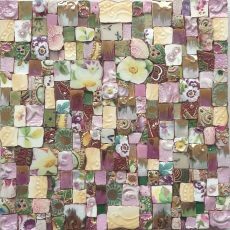 She started working with mosaics after being inspired by the abstract wall panels of contemporary Italian mosaic artists. 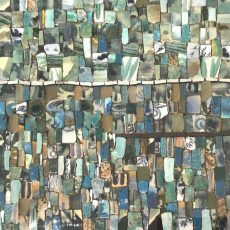 She works with a range of materials; stone, marble, hand painted Japanese porcelain, pottery, minerals, gold, silver and bronze. There are several genres to her work though she is continually exploring new ideas. Each mosaic is unique and takes days to complete. Every piece is cut individually to fit its place in the design and no grout is used. 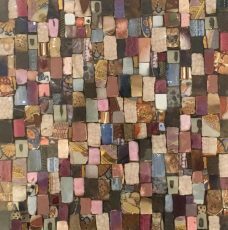 The mosaic is textural and this, combined with reflective tesserae, animates the piece as it catches the light. 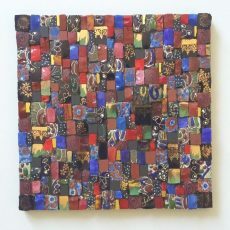 The mosaic is carefully mounted and protected by perspex, bolted at each corner creating a clean, modern piece of art.